Composica is more than an authoring tool. It’s a collaborative, responsive authoring platform. Work together. Reuse existing content. Share ideas. Assign tasks. Publish your e-learning creations to HTML 5, LMS, PDF or desktop. Authoring freedom is our number one goal. Forget about limited, form-based authoring tools or bulky, rigid course templates, players, and wrappers. Composica puts you in full control of your course’s design and behavior. Any object can be styled, modified, and positioned to your heart’s content. Go above and beyond the standard question-types and interactions. Single Choice, Multiple Choice, and Fill-in the Blank questions are only the beginning. Fully customizable Sort, Matching, Drag-and-Drop, and Hot Spots questions are readily available in Composica, and there’s much more. Correct, incorrect, and per-answer feedbacks are nice, but they're barely scratching the surface. Respond precisely to what learners are doing. Whether it’s a complex multiple choice condition, or a specific sort item order. Animated corrections are available for all question-types. Embed blogs – open, moderated, or view-only – right within course content, with or without external URL access. Allow learners to comment on any piece of course content right within the course, and share their own tips and knowledge with everyone else. Add rating objects, RSS feeds, and mashups with other services. Whether you call them quizzes, assessments, or tests, Composica does them bigger and better. Divide questions into sections or categories, and control their weight, question pool setting, randomization, and much more. Unparalleled, customizable feedback options are available upon test completion. Author courses in any language. Composica never limits you to a set of predefined languages. Easily export course text to translate it to multiple languages using the XLIFF standard. When ready, publish directly to any available translation. Our right-to-left support is extensive and applies not only to text, but to entire course layouts. 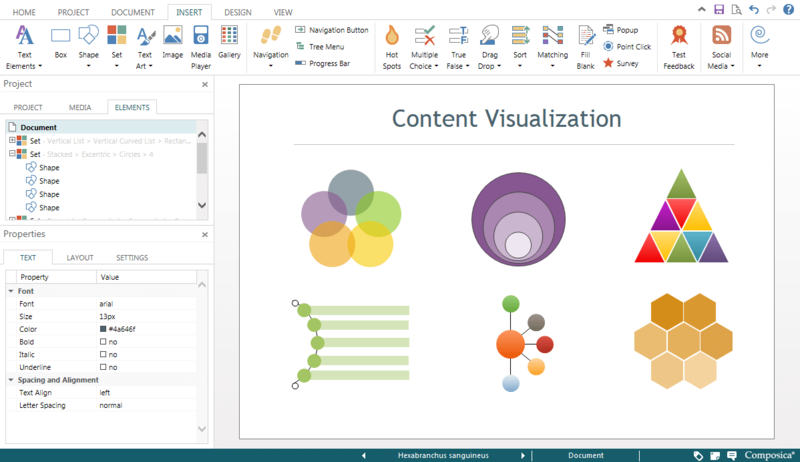 Import existing PowerPoint presentations, or even individual slides, into your courses. Imported content becomes fully editable in Composica, not just a static image. Comments and notes from PowerPoint can be converted to Composica tasks. Motivate learners by making quizzes fun and attractive – present them as highly customizable games. Games can include any question-type and vary in degrees of playability and win/lose conditions. Whether it’s a page-turner, free navigation, or a complex branching course, Composica can do it all. In Composica you control the flow of navigation and the ways learners can progress through the course. Customizable menus, trees, progress bars, breadcrumbs, and many other objects are at your disposal. Composica offers unparalleled collaboration features for your team. Authors, designers, subject matter experts, contributors, and reviewers, can all work simultaneously on a project. Teammates can see what everyone is working on, open tasks and review notes, post on the project's wall, and even group chat. Ever needed to recover text you replaced weeks ago? Restore a deleted page? Now you can. Full history is maintained for every document and media asset in your courses. Easily browse through history and restore documents to any previous state, mark major revisions, and even undo removals. Reduce development time by saving, cataloging, and easily reusing pieces of content from every project. Reuse media assets from your own project, the central media library, or directly from other projects. Create widgets from content you reuse often and place them in your project’s widget library. Authors can request course reviews from existing or external users, and assign them to review the entire course, or only specific parts, or even specific translations of a course. R‍eviewers get a special dashboard with their review assignments, where they can launch the course and add review notes as they go through it. course, and be assigned to anyone on the team. They can also be tagged, searched, prioritized, and get commented on. Additionally, each task keeps a detailed audit trail of any changes, and sends email notifications accordingly. ‍In e‍ffective e-learning development communication is key. Composica provides community dashboards where team members can see who's online and what everyone is working on, read, post, and comment on the project's wall, and quickly communicate using one-on-one or group chats. Courses authored and published using Composica are HTML 5 based and are designed to work in any modern platform and browser. N‍o need for any apps or players. C‍omposica reports every detail of the learning experience to the LMS or LRS of your choice. Other formats are also available, including a lightweight standalone executable, an installation package, and a simple zip format. 0% volume pricing discount applied! * Need to host Composica on your private network? No problem. * We have great educational discounts. Contact us for details. Oops! Something went wrong while submitting, please try again. Thank you! You will soon receive an email from us.